SRI RAMA CHAKRAM, THE BOON DEDICATED BY SIDDHAS ! One bow, one word and one wife, that is Rama ! There are innumerable methods of worship to invoke the power of Sri Rama. The one advocated by the siddhas is very simple, yet powerful. All the deities, rishis and sages give their benevolence by mere gesture of their fingers. At times they become powerful weapons too to destroy demons and demonic qualities in men and other human beings. To accumulate power in the fingers is not the right of the good natured human beings and sages, ordinary human beings also have the right to accumulate power in their hands and fingers. For this siddhas have devised the chanting methods of Sri Rama mantra by moving the fingers on the Sri Rama chakra. The methodology of doing the nama japa of Sri Rama is given with the help of Tamil characters. 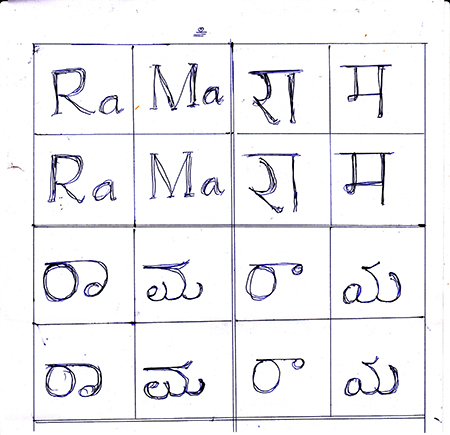 People belonging to other languages or who have developed their liking to other languages can use the following chart of writing the name of Sri Rama. The main idea is there should be four letters or four boxes of characters and three sequences constitute one cycle of Rama chanting. Please refer the steps involved in Sri Rama chanting in the enclosed video. To facilitate the devotees of other languages Sri Rama mantra is written in the popular languages. Legends can be written on the methodology of this Sri Rama chanting and practice. Some of our useful daily activities are enumerated here. We use our forefinger and the middle finger only for touching the Sri Rama mantra letters or characters. The forefinger denotes Satguru or for those without a Guru it denotes Brahaspathi, guru for devas. The middle finger denotes Saturn, the longest finger which denotes our fate and ruler of destiny. In the practice when Saturn follows Guru, our destiny is controlled by our Satguru. What a great boon ! The three sequences denotes number three, which is favourable for guru. Vamana avatar is the first avatar in the form of a human being, though the avatar was a tiny three feet creature. The three sequences in Sri Rama chanting denotes these three steps of Vamana avatar, the first steps for mankind. 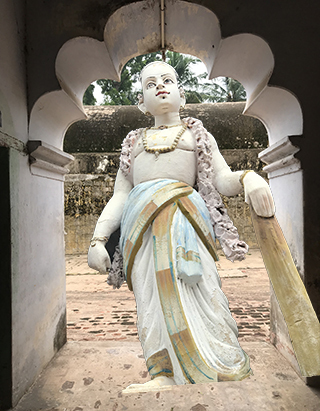 When Vamana measured the earth and sky with these three steps, everything in the universe and beyond the universe got purified as it goes with the words of Sri Ramakrishna Paramahamsar. Though normal human beings are not Vamana avatars and they cannot purify the universe with just three steps definitely they can purity their routine activities with regular Sri Rama chanting with their two finger tips. An incident from the Mahabharata with elucidate the power further. Bheesmar was lying on the bed of arrows created by Arjuna. He was waiting for the utharayana punya period to finally deliver his mortal body at the lotus feet of the Almighty. Meanwhile he experiened great thirst and nobody was there in the battle field to supply drinking water. Arjuna came to know about this dire situation and shot an arrow in the air praying Ganges, the divine mother of Bhisma. But nothing happened... The arrow shot by Arjuna made a big hole near Bhisma and kept quiet. Others also including Dharmar looked at each other. They did not know any means to quench the thirst of Bhisma. Sahadevan came to their rescue. He quickly rushed to the place where Bhismar was lying and his fingers danced at the place where Arjuna's arrow stood on the earth. At once water or rather Ganga spring came forth from the holy place where Sahadevan touched the earth. The spring fell not only on the dry lips and mouth of Bhisma, it showered on the entire body of Bhisma. Because it was not oridnary water ... ! It was the holy spring of Mother Ganges to bathe her son once for all, for all. Needless so say everyone who watched the scene was dumbfounded. Nobody knew the reason why Ganges water did not come in the beginning or what created Ganges water to spring forth when Sahadevan touched the soil. As usual Sri Krishna revealed the secret behind the great deed of Sahadevan. He was practicing Sri Rama mantra chanting with his guru and saturn fingers and the power so long hidden by the great warrior came forth in the form of holy Ganga water. Can you call it Ganga water, no it is definitely the milk full of affection that flows from the breast of the loving mother Ganga to her beloved son, Bhismar. That is the power of Sri Rama mantra chanting. You can derive amrita from a stone, what else you want ? Only in the beginning it is necessary to practise Rama chanting on the Sri Rama chakra or yantram. As days pass on, you can practise the mantra on the open palm, table top, chair handles, etc. This chanting is also very much effective on paining limbs and aching parts of the body. The currency notes, food items, beverages, etc. acquire enormous power of cure given with the hands that practised Sri Rama mantra. Those who practise kara darshan, the divine procedure of watching one's open palms at the dawn of the day, know the value of their first three steps on getting down from the bed. These steps towards the sun in the eastern direction show ways and sow seeds for the deeds to follow that day. It is also a good practice to have darshan of gopuras with nine kalasas or more and the avatars of Sri Maha Vishnu like Vamana, Narasimha etc. to eradicate the evil forces that we have to face every day. The human body comprises of nine spiritual bodies and these spiritual bodies get purified by having darshan of gopurams with nine kalasas or more. Practising Sri Rama mantra over the yantra simplifies this procedure of cleansing the subtle bodies very effectively at the same time effortlessly. That is the greatness of Siddhas ! 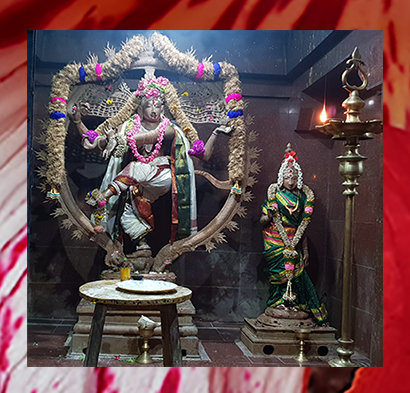 The greatness of Sri Rama mantra in mitigating the power of lust in the human minds is greatly revealed by the miracles of Sage Ramsurat Kumar of Thiru Annamalai. He has cured many of his disciples by gently squeezing their forehands with his caress and press cures only known to the siddhas. The subtle nerves that connect the forearms with the karmic bonds in the brain mainly populate the area between the palms and the elbows. This secret is known only to the evolved souls like Sage Ramsurat Kumar. During the marriage ceremony of a disciple's son, homa was conducted as per the directives of Satguru Venkataraman. In one of the homa kundams the tharaka mantra of Sri Rama was thus written in Telugu, One wife, one word and one arrow. The interesting fact is that the person who wrote the mantra used to have illicit sexual relations prior to his entry into the satsang of Satguru Venkataraman. To alleviate the sufferings of His chosen disciple Satguru thus undertook to clear off his karmic debt. To this day also Satguru's blessings are there for those who chant the said Sri Rama mantra in the manner specified. The chanting of Sri Rama mantra is beneficial in this guru year, because of the kusa effects that accumulate in the chanting. When you chant three times Rama, the effects is chanting six alphabets. That is kusa. How thoughtful of the siddhas to devise such a kusa chakra with Rama chanting ! When you apply holy ashes (vibuthi or thiruneeru) on your forehead, some lust effect is hidden and spread over your forehead because of the malefic effect of saturn. But this effect is mitigated by the siddhas when you practise Sri Rama chakra. In astrology guru planet is the most powerful of all the planets to bring goodness and prosperity to the owner. But the association, aspect and ownership of the planet with other planets may alter the good nature of guru. Similarly the association of the saturn finger with the guru finger in chanting Sri Rama mantra may pose some difficulties. But as long as a disciple has faith in the words of Satguru he is bound to get all the benefits bestowed by the powerful Brahaspathi. In recent times, Yogi Ramsurat Kumar showed the power of Sri Rama chakra to the world by continuously chanting the name of Sri Rama with his heart and soul and continuously writing the name of Sri Rama in either of his two hands ! And this writing is visible even to the ordinary devotees. When a devotee with very short life span met our Satguru on some personal issues, he was advised to chant Sri Rama mantra with his two fingers playing on his right thumb. Needless to say, the life line of the human beings lies within these three finger bases, is it not ? The sincere devotee lives up to this date to bear testimony to Satguru's words ! When Sage Ramsurat Kumar visited his Satguru Ramadas, he was initiated into Sri Ram Jeyaram Jeyajeya Ram mantra only on the third occasion of his meeting with the Satguru. Only on the third occasion the fruit was ripe enough to be eaten. From this instance we can understand very well the duality concept of the Almighty. To taste the nectar of Rama, you should become Lord Siva Himself. The converse is also true. That is how Yogi Ramsurat Kumar landed at the holy feet of Lord Arunachala with the holy name of Sri Rama on his lips and finger tips ! A sage came into this world like a seller of toys for children. To him every human being was a doll. Many people visited his shop on a carriage and began to buy dolls for their children. Most of the people gave good, negotiable coins and notes to the old man. Very few gave counterfeit coins, soiled and torn notes unknowingly and very few gave fake currency knowing well about its authenticity. The old man never grumbled at the sight of the fake currencies or when dealing with those people who tendered such notes. A person noticed that this man was accepting all types of coins and notes and gave dolls of good quality. He asked the old man whether he knew that some people were giving fake notes deliberately. The old man replied with a smile, "God who is the knower of everything does not grudge at the sight of such persons. He gives them delicious food, attractive dress and nice place to take rest. Why should I, His servant, grudge when anyone tenders a fake note ?" That type of magnanimity is bound to grow though not in a day's pratice but when Rama chanting continues for years and years like Sahadevan's ! There is a wooden wardrobe at the home of our Satguru. The words written on the wardrobe are, "Think Good, Tell Good, Do good !" Can there be a better translation of Sri Rama mantra than these words ? Whenever our Satguru refers to anything put in the wardrobe, He used to talk about the "Tell Good" wardrobe. That is bringing always the thought of the Almighty in whatever things you are doing in this mundane world. Many people are intrigued about the messages conveyed by their own shadows and many are quite ignorant of them. Actually from a careful study of one's own shadow all the future incidents and mishaps can clearly be predicted. One such practice is Sri Rama chanting with the said chakra. Sri Ram Jeya Ram Jeya Jeya Ram can also be continuously chanted to develop the art of foretelling the future. Here the three jeyas i.e. victory inevitably follows Sri Ram. There is no doubt about that ! What is victory that follows every human being is construed in the beginning as a shadow. An interesting incident is narrated to explain the truth. Once Lord Siva was moving along the celestials with His Consort. Parvathi Devi witnessed on the earth an old man who was stitching his torn clothes with calmness and quietness that threatened even the devas. On seeing this wonderful sight Devi asked the Lord why should not He shower some boons over the nice old man especially when he was in rags. The Lord replied with a sweet smile, "Devi, I am ready to give any boon to this deserving saint, but he is not at all prepared to receive any favour even from the Almighty. Like any other wife Devi was not ready to accept the answer of the Husband and there followed a heated argument. At the end, the Lord asked Devi to grant whatever boon She deemed fit to the poor man. The two descended in front of the hut of the old man. The old man at once recognised the Rulers of this world and invited Them with folded hands. He offered Them buttermilk and began to continue his work of stitching his torn clothes ! Parvathi could not control Her feelings. Lord Siva as usual remained quite composed. As some minutes passed, Parvathi asked impatiently, "Naina, (means to address who is highly evolved and affectionate) do you know who we are ?" The old man replied, "Yes, mother. You are Parvathi and He is Lord Siva and that is why I give so much love and respect !" Devi became dumbfounded. The Lord looked at Her with the unexpressed feeling, "I already told about this old man. You did not listen to me. Now you reap the harvest. I will enjoy the drama as usual ...". However, She managed Her wits and continued, "You are in rags. Knowing well that we are the rulers of this universe you are not interested in asking any boon from us. That is very intriguing. Ask for some boon ...", Devi thus insisted and continue to express Her intention of offering anything that was demanded by the old fakir. In the end, the old man asked for one boon, ''If at all you want to shower your blessings on this old man, please grant a blessing that this thread should follow the needle whenever I am stitching." Devi became quite astonished on hearing the words of the old man. With a murmur She continued, "What is there to be given as a boon by the Almighty. If you continue your stitching, the thread necessary follows the needle. And no boon or blessing is necessary to support the needle." With a broad smile the old man continued, "That is what, Mother, I mean. If you do a good act, good result is bound to follow. What boon is necessary to bear fruit for the act ?" Lord Siva smiled at Devi with a furtive meaning. It is needless to say that the Two disappeared on hearing the words of the old man. It can also be said that the old man saw neither the Lord nor His Consort, but only the Almighty ! Because the old man had no shadow of his own. There is a thin line of consciousness between our waking state and the dream state. 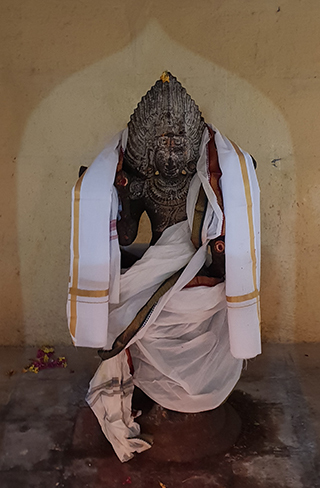 If we continue to worship Sri Kalabhairava of Thirunallam with coconut oil lamps, at least eight, regularly, over a course of years we can decipher these two states of 'nallam consciousnes or wakefulness'. Alternatively, the pratice of Sri Ram chakra will also bring about the same result. Only upon losing consciousness of the dream state, we will begin to taste the nectar of bliss of the Almighty.